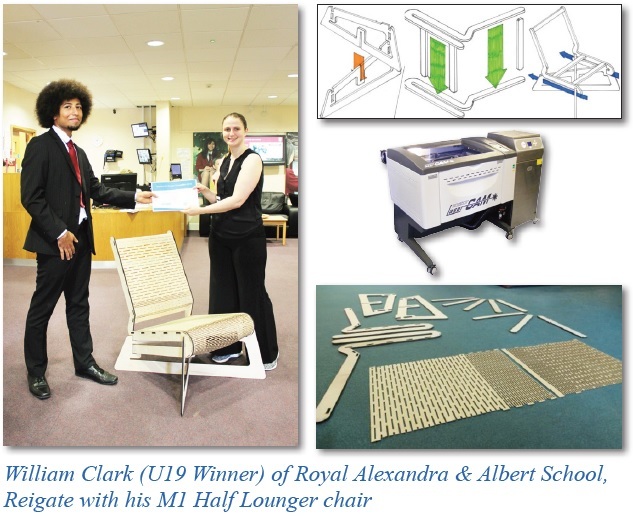 TechSoft are proud to announce that the winners of their annual 2D Design U19 and U17 competitions are William Clark (U19) of Royal Alexandra & Albert School, Reigate with his M1 Half Lounger chair and Taranveer Sahota (U17) of Coundon Court School, Coventry, with his Mondernist-inspired speaker. Congratulations William and Taranveer! After seeing the entrants to this year’s competition, the judges at TechSoft found it very difficult to split the winners from the rest of the pack, but eventually made the tough decision. Both designs use plywood, a flexible and highly economical material to great effect, stretching both its material and aesthetic properties to create both striking and functional designs that were created using 2D Design. William’s aim was to create a flat pack lounger chair that incorporated the user’s comfort as a central design factor. The project was designed entirely using 2D Design V2 software and manufactured using laser cutting. William was able to ensure each part was designed with accuracy, using various contouring, mirror and repeat routines and this enabled him to create a design that not only looks individual, but also comfortable. The angles William has designed into the chair took six prototypes to perfect and we are big fans of the strong iterative design approach he has undertaken. Taranveer decided to undertake a trip into Modernism, coming out the other side with a classic yet functional looking speaker design that, although designed entirely in 2D Design, looks more like something that has been modelled in a full 3D package. Much like William the use of contouring proved specifically invaluable in preparing his rebates for the central acrylic stand-off slats. 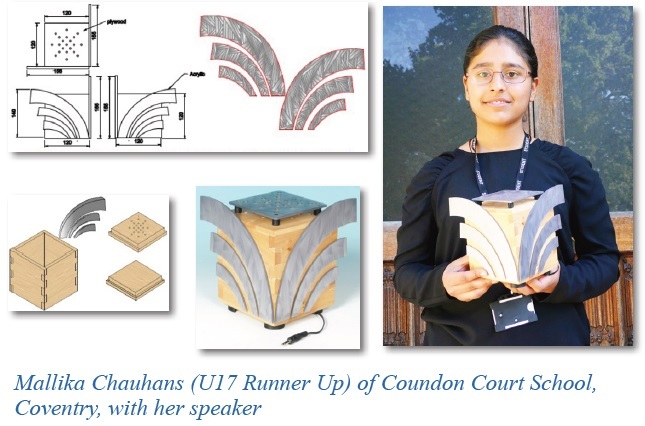 Coming a very close runner up in the U17 category was Mallika Chauhan, also of Coundon Court School, with her art deco inspired speaker design. 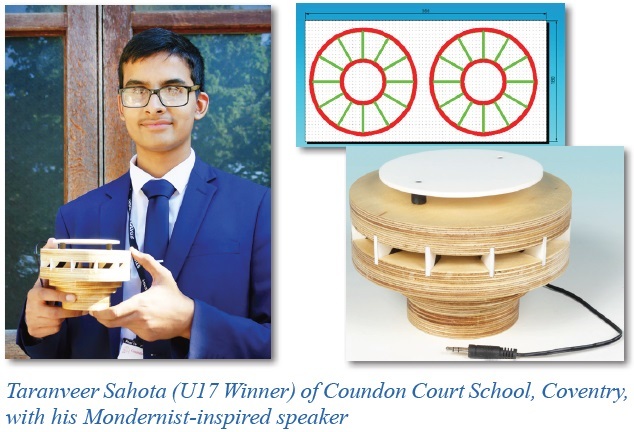 Much like the winners, Mallika’s design was created entirely within 2D Design and together the elements form a product with both functionality of assembly and aesthetic impact in its use of materials. Together Taranveer and Mallika have shown how diverse yet successful outcomes can be even when creating the same product using the same design platforms and materials. We would like to say a big thank to all the entrants; the work we received displayed outstanding CAD/CAM skills and innovative thinking. Well done to all the teachers and students involved. It has been such a pleasure looking through your designs and the work presented to us. 2D Design and 2D Primary continue to allow so many students to gain the skills that the design and engineering industry so desperately needs. 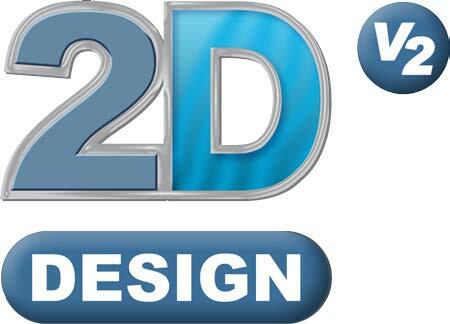 Coupled with the output possibilities of TechSoft’s range of equipment, such as laser cutters; millers/routers; plasma cutters; embroidery machines; and printing and cutting devices, we are proud that 2D Design is such an important tool within Design & Technology.